In a surprising move Tuesday — the day after the father of a Sandy Hook victim killed himself — the U.S. Senate convened an hours-long gun violence hearing to discuss a “red flag” law that would enable loved ones or law enforcement to have guns temporarily removed from people in crisis. But rather than proposing that the Senate approve a red flag law, Sen. Lindsey Graham (R., S.C.), chair of the Judiciary Committee, urged passing a bill that would establish funding incentives for states to do it individually. 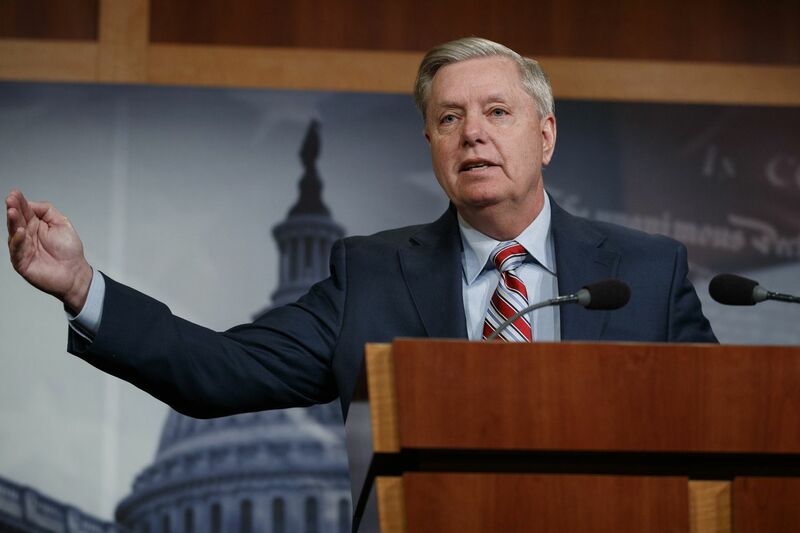 “My hope is that what we will do up here in Washington is — I think passing a federal law is probably beyond what the market can bear, but creating incentive at the federal level for states who want to go down this road,” Graham said. The discussion about the law, which advocates say can prevent suicide, came after suicides in the last week of the father of a girl killed at Sandy Hook Elementary School in 2012 and two Parkland, Fla., teenagers who survived the 2018 high school shooting there. It was also an unusual move for the Republican-controlled Senate, which has not convened hearings or allowed votes on gun control proposals in recent years. Fourteen states and Washington, D.C., have a form of red flag law, also known as an extreme risk protection order or ERPO. The law allows law enforcement officers or family members to ask a court to temporarily remove firearms from somebody who is believed to be a threat. In Connecticut and Indiana, such laws have been associated with a decrease in suicide. Other states have seen success in using the orders to confiscate firearms from potentially dangerous people. "We need to stop violence before it occurs,” said Graham. Many of the states passed such laws after the Parkland shooting, and 32 other states had bills introduced as of early March. In Pennsylvania, two Republican legislators from Montgomery County have introduced ERPO bills. Gun-control advocates hope to pass universal background checks and other more stringent laws. But they have often focused on state-level action, in a bid to pressure the federal government. “The Senate Judiciary Committee hearing on red flag laws showed that regardless of party, we all agree there is more we can do to intervene before warning signs become tragedies,” Everytown for Gun Safety tweeted after the hearing. Gun-rights advocates have opposed ERPO laws, saying they don’t provide appropriate due process for the individual in question. “The NRA has not supported any of the red flag bills introduced on the state level to date because they do not provide adequate due process protections," a National Rifle Association spokesperson told Politico. Because suicide attempts using a gun are more commonly fatal than other attempts, and firearms suicide is common, ERPOs have been touted as suicide-prevention tools. In Connecticut, the suicide rate dropped 13.7 percent in a decade, according to the American Psychiatric Association, and Indiana saw a 7.5 percent decline. In Pennsylvania, rural counties have the highest suicide rates, and two-thirds of the state’s average 1,400 gun deaths a year are suicides. “This is a step. It’s not a big step, it’s a small step. It’s a sensible step,” said Sen. Dianne Feinstein, the California Democrat who introduced the ERPO-incentive bill. The proposal would allow states to use federal funding to develop the court processes set forth in their ERPO laws. She and other Democrats also plugged universal background checks for gun buyers, a measure that passed last month in the House but has not gotten a vote in the Senate. Though supportive of ERPOs, they urged other action Tuesday, citing the shooting survivor suicides and New Zealand Prime Minister Jacinda Ardern’s ban on assault weapons last week, just days after the shooting deaths there of 50 people at two mosques. “It’s good to have a hearing — God bless you, Chairman, for holding this hearing — but let’s have some committee votes on the stuff that’s bipartisan,” said Sen. Cory Booker (D., N.J.).